Ojon Damage Reverse Conditioner | £23 // I was expecting a lot more from this conditioner and was a bit disappointed in it. If I remember correctly I got this for free along with the shampoo as I took an empty shampoo bottle back in to Boots. I’d probably be even more disappointed if I had have paid the full price. 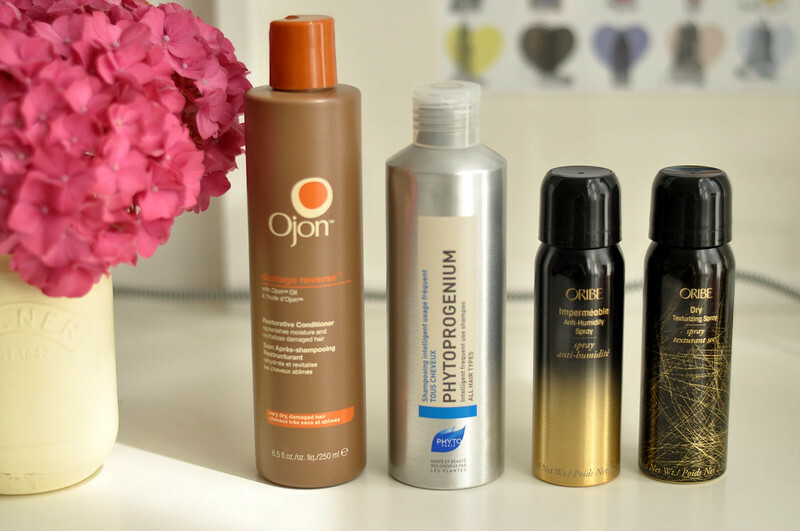 For me conditioner is the one hair product that I don’t tend to spend a lot of money on so to even think of spending £23 on a conditioner, not a treatment or deep conditioner, then it would have to be amazing. Think Philip Kingsley Elasticizer amazing. This is not. It is a good conditioner, it left my hair feeling soft and I didn’t have to use a lot of product but I can get that from a conditioner that costs £5. Phyto Phytoprogenium Shampoo | £12.50 // I've always loved the look of Pyhto shampoos and the metal bottle but in reality they just don't really work. I've had a couple of the lids break on me after only opening once or twice and I find it hard to control how much product I'm using thanks to the useless opening. Ignoring that though and onto the product which is the most important thing. This is an intelligent frequent use shampoo so the more you use it, the more your scalp is protect leading to your hair being in a better condition. Does this actually work? After using the majority of the shampoo I have to say no more than standard shampoo does. My hair always feels clean after using it as well as feeling pretty soft but nothing that stands out or can pin point to this shampoo a lone. Oribe Impermeable Anti-Humidity Spray | £19 // I bought this thinking it would combat frizz and fly aways caused by the weather, I didn't know it was actually more of a hair spray. If I had known this I don't think I would have paid £19 for it as my cheaper hair spray does pretty much the same thing. It does work at keeping my hair put and in the summer months or if it's raining my hair doesn't frizz up as much but is it really worth £19? I have to say probably not and I don't think I'd pay £37 for the full size. Oribe Dry Texturising Spray | £19 // This is one of those products that, sadly, isn’t worth the hype in my opinion. I can imagine this being amazing for those with shoulder length or shorter hair but for me with very long hair it just didn’t work. I applied it as directed and as seen by others after I curled my hair and I was left with volume that didn’t last very long and what felt like a whole can of dry shampoo on my scalp. No matter how little I applied, even just one spray, all I could feel was powder and my hair didn’t look any better either. I’m not planning on cutting my hair short any time soon so I feel like I wasted the £19 this mini can cost.